Pushing Limits is produced at KPFA radio in Berkeley, California, by a collective of unpaid staff members. It airs the 1st, 3rd and 5th Friday of each month at from 2:30-3 pm from KPFA radio, 94.1 fm. 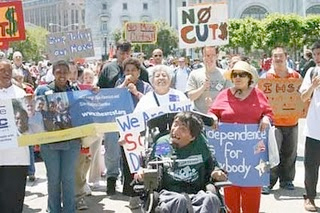 Collective members are people with disabilities. Our goal is to produce a radio program by people with disabilities that reflects the culture and thought of people with disabilities in the Bay Area and beyond. We are a proud part of the disability rights movement and approach our program from the left side of the political dial. Our guests are almost exclusively people with disabilities because we are generally the most expert people on the issues of our lives. Pushing Limits began broadcasting on KPFA in October, 2003. Our topics range from personal stories about individual disabilities to national and international political and policy questions. We analyze our problems, voice our outrage, celebrate our strength, and spend a fair amount of time laughing. To learn more about what we do, browse this website and click the links to our archives.